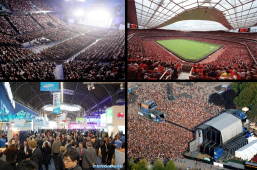 Crowded mass events like soccer matches, fairs, and concerts are always a challenge - for organization, for security, for catering. People have to be guided and well supplied. In the area of mobile communications and Internet people expect to being connected and informed by mobile network services. But this hardly works - often it is even difficult just to send an SMS. The issue is the incredible high capacity demand due to the dense crowd. More antennas, more hardware hardly helps - too much interference even worse the service coverage. Offering a dedicated information channel which is applicable by any mobile devices does cover the most of the information needs of visitors. Broadcasting this and combining it with social interaction via Facebook, Twitter etc. is the unique proposal of "MOTIwareCC". By a special developed Video Quality Enhancement system the quality is superior while the capacity demand is minimized. Now Being Informed at crowded mass events is easy again! It is white labelled and fully customizable. It is developed and offered in co-operation with ITware Kft. (www.itware.hu). ITware Kft. is the specialist of mobile business applications and enterprise software. 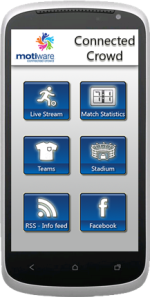 Developing customized, interactive mobile apps and strong, professional solutions, ITware Kft. has been working for nearly 20 years in the forefront of mobile communication. constant output power: 40 dBm. 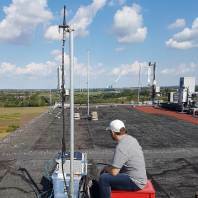 With the used measurement configuration, different radio conditions have been tested in 3,5 GHz domain as well as 900- and 1900 MHz bands. The evaluation of the measurements was done with the - among others - brown-iposs software WiMAP-4G.